A total retail value of $27.97. Save $7.98! These are great towels. Very soft and hold a lot of water. Purchased the trio package just to see how good they were. I was a bit skeptical but was quickly surprised after the first swipe. The towels easily dried my car and I only used 2 of the 3 (I used the smallest and the largest). When I washed my car the temperature out was 50 degrees which has always caused a bit of a car drying challenge and normally requires 4 to 5 large towels tom accomplish the task but with these I only need 2. I am sold and going to order another set. 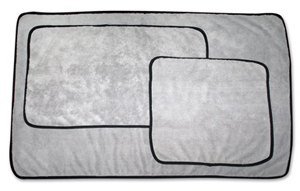 ProsBest car drying towel In have used and the price for the set is very reasonable. Fine quality microfiber towel you can use with confidence. ProsNo fear of pickup particles that will scratch. Absorbs water easily. Great for towel drying in dry wash. These towels are awesome. They soak up water droplets after washing your car and leave no streaks. I wish I had found these years ago, as they leave a beautiful shine and save lots of time.